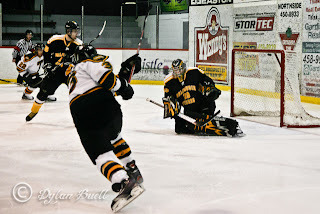 Felix Poulin blasts one by Bobby Nadeau. There is no sugar coating tonight's game against Dalhousie, STU had to win and they weren't up to the task losing 7 to 4. In four games this season the Tommies lost all of them, this being the worst of the bunch. The Tigers held period leads of 2 to 1 after the first, 4 to 2 after two, and the final 7 to 4. Dalhousie leap frogs the Tommies in the standings and take over sole possession of seventh in the AUS. Scoring for STU were Sebastien Bernier, Alex Labonte, Felix Poulin, and John MacDonald with his first as a Tommie. On the plus side it was great to see Bernier and MacDonald score and have Alex Labonte score in his first game back since before Christmas. The Tommies will have to pick up the pieces from tonight and get ready for a tough game tomorrow against an Acadia team that lost tonight to Moncton. STU remains 5 back of St-FX, who lost to PEI this evening.